When I turned 60, I took up surfing. This might seem counter-intuitive. A silver haired woman in the line up with the groms while all my friends started knitting or playing cards. But life as I had known it had imploded, and layering on an oversized challenge seemed oddly logical. I was in a small Mexican fishing village when a friend loaned me a soft top. He pushed me into an oncoming wave, and I was instantly hooked. I was an avid bodysurfer in my teens, primarily at Oak Street, Brooks, and Pearl. When I changed to a board, it was under the watchful eye of lifeguard John Parlette. I knew he’d never let me drown (insert smiley face here). I surfed on and off for a couple of years, but lost the thread when a marriage moved me inland and work combined with child rearing took priority. Getting back onto a board 40 years later, and racing down the face of a wave, was transformative. When asked, I say that surfing saved my life. Most certainly, the act of catching and riding a wave has gotten me through some rough times. In the water I find new strength, confidence and balance – characteristics that had been undermined by events that had been outside my control. Just getting in the water changes my emotional temperature. In the four years since I’ve paddled out, I’ve progressed from long board to semi-short board. My style may not match the energies of most of the kids. I’m not into attacking the wave or spinning fancy tricks. I’m more a Zen kind of ocean girl. I like the sensation of feeling connected to the energy of sea, and the waves that have journeyed thousands of miles to break on the shoreline. Friends have carried me along the watery path, and I have so many to thank. Don for shoving me into that first wave; Cathy for buddying up with me and introducing me to local breaks; Jim for coaxing me into bigger surf; Dennis, Patrick and James for gifting me boards; George for tips with the lineup; Cynthia for being my cheerleader; Dennis for critiquing my style; Bob and Danny for being my Sano buds; and Austin for introducing me to more locals. A few weeks ago, I had one of those moments – the magic ones that are forever printed on your mind. I had the honor (and the luxury) of surfing Sunset Beach on the north shore with my son, Austin. Now 33-years-old, he constantly asks me why I wasn’t like I am now when he was a kid. I tell him we go with where we are. 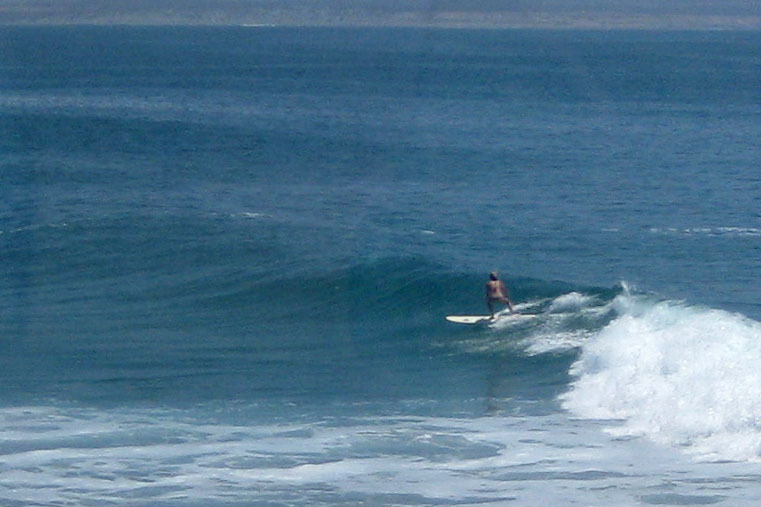 We had overhead waves, glassy conditions and generous locals in the water. ‘Backyards’ was breaking both left and right, and we surfed to exhaustion (well, maybe my exhaustion). I am thankful to live near the sea and cannot imagine ever living far from her shore again. The rhythm of the tides, the rise and fall of the surf, the still abundant life on the shore, feeds the essence of me. My soul comes alive. Next to and on the ocean, I am my best.